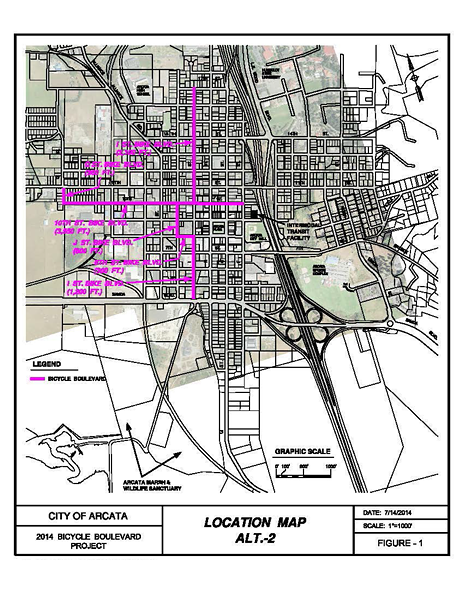 A pair of Arcata streets is slated for improvements over the next several months — a move the city hopes will encourage cyclists to access the city’s busy downtown. The construction consists mainly of signage. The city will advertise the bike boulevard with signposts and with striping painted on the ground. The stop signs at some intersections will be changed to allow a more steady flow of traffic along the route, and some minor paving will be done to encourage cycling. For a list of the specific improvements, visit the city website. The idea is to make it simpler for cyclists to get to and from — and through — town. What’s a tiny bit puzzling is a short detour off of I Street between Eighth and 10th streets. The boulevard will redirect cyclists traveling north or south on I Street a block west — adding two blocks of travel. It’s by no means a mandate — cyclists can ride on any city street — but it seems incongruous with the city’s goal of “free-flow travel for bikes.” It also seems to have the potential to confuse cyclists. Councilwoman Susan Ornelas (a cyclist herself) said there was some difference of opinion about the definition of a bicycle boulevard, and what the city was trying to accomplish. “Some [council]members thought of as a quick get-through to get where you’re going,” she said. “The transportation safety committee — they thought of it as a nice place to access businesses from.” Ornelas said businesses on I Street were in favor of adopting I Street as the bike boulevard. “[City staff] came with this hybrid thing,” Ornelas said. Despite the “uncomfortable” 90-degree turns that the boulevard is suggesting cyclists take, she agreed to the current design with the rest of the council in July (Councilwoman Alex Stillman was absent), not wanting to send it back to staff for more changes. Because of the relatively light construction required (to the tune of $160,000) Ornelas said the boulevard could potentially be adapted in the future. Construction is slated to begin in late September or early October and will last 100 days, depending on weather.